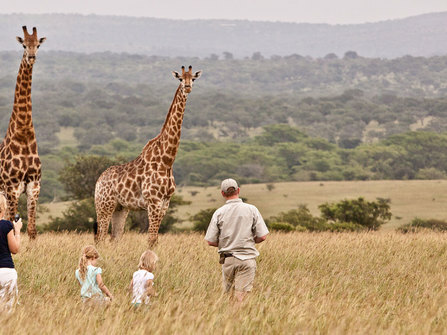 A question that is frequently asked and is nigh on impossible to give a straight answer to is how old should children be before you take them on a safari? It really does depend on the children (and the parents). At the very least, they will need to have the capacity to be in a 4WD or on a game walk for a couple of hours without driving everybody mad. Some kids can do this when they are 3 or 4 years old, others would be a nightmare at that age. The first time I took one of my children on safari, she had just turned 6 years old. We had a fairly intense schedule of game drives (not what I would usually plan for guests, but hey this was work) and I was worried she would lose interest after spotting a couple of big animals. I was entirely wrong, her capacity for long game drives was entirely undiminished throughout. She loved every game drive, chatting to the guides, bouncing around roads with the wind in her hair, learning about the edible plants and fruits in the bush and of course spotting all manner of wildlife big and small. It really was one of the most memorable experiences I have ever shared with her. Under 5s: Arguably at this age, children are along for the ride only. You’ll need to use your own judgement on the child’s attention span. It can make a lot of sense to head to a small lodge with organised children’s activities (and childcare) or to have exclusive use of a private safari house. Under 12s: Children five and older are at a perfect age for a safari. Used to being in a primary school environment, they’ll love learning about the animals, identifying tracks and poo and their collective nouns (dazzle of zebra anybody?). It is worth making sure that game drives won’t be too long (2-3 hours is fine) and that they have time / space to run off energy at some stage in the day. Having access to a swimming pool can be a big plus. Teenagers: We usually find teenagers are as, if not more, engrossed than adults on safari. Activities always work well and challenging adventures such as a multi-day walking safari or even climbing Mount Kenya can create a great centre point to a safari holiday. Hopefully though, I’ve made clear that these are general guidelines only. Of course some National Parks, camps and lodges have age restrictions, but we will always be able to recommend somewhere that welcomes younger children. Generally under 12s pay less both for park fees and accommodation costs.